I did some traveling this weekend and was happy to bring Tatum along for the journey. Honestly, I didn't like Tatum at first. She just seemed to be snarky toward her stepmother and father, so it was hard to feel sympathetic for her. However, that changed as I continued reading. Not so much the sympathy, but more that I came to like and respect her. She had a good attitude about working hard for a goal, helping and becoming friendly with her stepsister, listening to her abuela, and considering things from her stepmother's point of view. The title is a play on the fact that Tatum reflects a lot on how to end her emails and on how other people have ended theirs. This was a cute addition to the Cinderella story, and on a deeper level, good commentary on how what seems like the end is often not the complete end. After the salutation is written, the story is not completed but just transferred. It is now with the receiver and it carries on with how he or she reacts and possibly responds to it. I enjoyed the fact that the ending of this one did not mirror the ending of the Cinderella story. There is a Happily Ever After, but the relationships are different -- and I think better -- than how the relationships end up in the classic story. 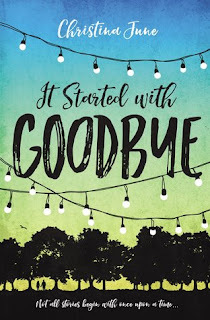 This was a quick, cute read and I enjoyed it! 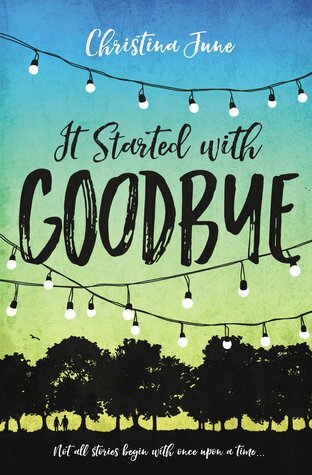 It Started With Goodbye comes out on May 9, 2017. Thank you to Blink YA Books for sending me an advance reader's copy in exchange for my honest opinion.